Having not been able to read the stage director’s programme declaration before the performance I was taken aback when during the overture film footage and stills were projected onto the walls of the stage and the centrally placed pentagon shaped building, which was permanent during the entire performance. What I saw was Stalin (repeatedly) and other Soviet leaders, cultural icons such as David Oistrakh, athletes and – most of all – soldiers, air force pilots and anything relating to war. This is no unusual device in today’s operatic world, as a protest against war, violence and oppression, and it was easy to relate it to corresponding situations in Russian history, for instance the time of Ivan the Terrible, who is the tsar in Rimsky-Korsakov’s opera. The Tsar’s Bride, Marfa Sobakina, was also an historical person who married Ivan in 1572 and almost immediately after the wedding died mysteriously. 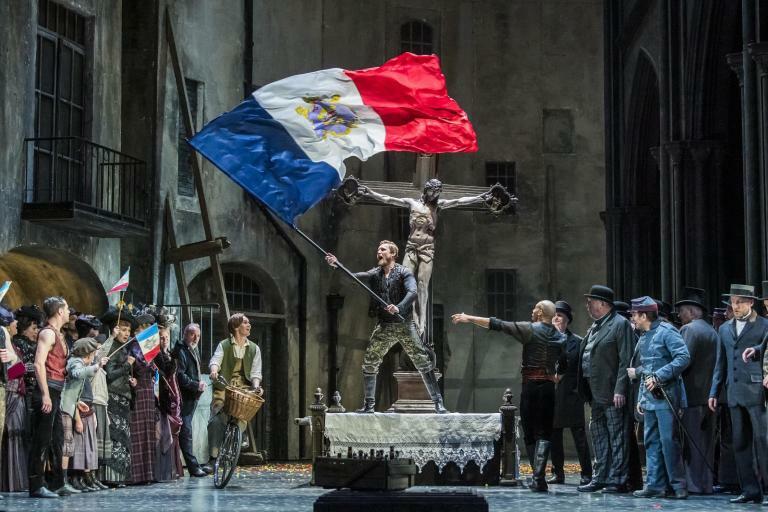 I felt even more bewildered when the opera proper began: it was set in the post-war spring of 1946, but it is about the tsar, the boyars, the oprichniks (the tsar’s bodyguards) – in short, historical stuff. Director Yuri Alexandrov explains this in his foreword: ‘People have been through devastating war horrors, and they think they can breathe freely again and put all the pain behind them, but reality is suffocating and there is no way out’. I understand, but why recreate the tsardom in 1946 when the last tsar was dethroned in 1917 and decapitated the following year? Oppression existed under Stalin’s reign as well, but that is another matter and as far as I am concerned I would have been fully satisfied to see the opera set in its real time with period costumes and understand the parallel that history repeats itself, despotism existed in Ancient Rome as well as in Old Russia and the 1930s Soviet Union and it exists today. Having come to terms with this falsification of history I could disregard the costumes and enjoy the play without further complications. Well, not quite. Since I last visited Estonian National Opera, they have replaced the surtitles above the stage – which were eminently readable with large print – with two small screens on either side of the stage. The print was much smaller and only with great effort was I able to read the text. After the interval, I was made aware of a small screen above my head with very readable print, but it required me to move my head up and down all the time. I wonder: what was wrong with the previous surtitles? Rimsky-Korsakov’s operas are rare birds outside Eastern Europe, and this was the first opportunity for me to see one – although I am quite familiar with several of his sixteen works of this genre through recordings. There is a thoroughly recommendable version of The Tsar’s Bride from the Mariinsky Theatre in St Petersburg under Valery Gergiev with the late lamented Dmitri Hvorostovsky as Grigory Gryaznoy, Marina Shaguch as Marfa and Olga Borodina as Ljubaša. This production was not quite on this level, but it still had a great deal to offer. Dramatically it is, like several of his other operas, a slow starter. The first two acts, played without an interval, took some time to get going, but during the remaining two acts the dramatic temperature increased. Under conductor Kaspar Mänd musically it also grew, and Rimsky-Korsakov’s use of Russian folk music is as always very attractive. The two leading ladies, Elena Brazhnyk (Marfa) and Helen Lokuta (Ljubaša) had the juiciest arias. Marfa’s long solo with harp in the last act is the musical highlight, and Elena Brazhnyk sang it excellently with her bright voice. Helen Lokuta, and old favourite of mine, showed off in her solo towards the end of Act II. Young tenor Regio Tamm also made a good impression in his two arias. Rauno Elp, a leading baritone at the National Opera since 1992, has always convinced in a wide variety of roles and he brought great intensity to the central role of the oprichnik Gryaznoy. He has always been a great actor and practically owns the stage as soon as he appears. Vocally there have been signs of wear over the last few years and his vibrato has widened alarmingly since I last heard him. But such is his stage presence that one can overlook such things. Bass Priit Volmer, another mainstay at the house, has also lost something of his former majesty but he, too, is a great singer and actor. Märt Jakobson as Skuratov also convinced, as did Mart Madiste as the oily Bomelius. Ana Maria Gergely and Marcus Nilson from the National Ballet were excellent in their ballet sequence. The production was premiered at the end of January and the teamwork was firmly settled. Before the performance there was a short ceremony in front of the curtain where two of the leading singers, Helen Lokuta and Rauno Elp, received the SEB Audience Award for 2019. Two worthy winners indeed!